A story of a regular girl who is trying to make big in her life. She is a little less focussed when it comes to her job. A supportive father, a nagging mother, a few good friends, a reliable colleague, a picture perfect boyfriend and a sarcastic boss, Kajal, the protagonist of the book, her life was similar to the life of any regular girl. She works for an ad-agency where she has to deal with clients from every field and ensure that they keep grinning from ear to ear. There comes a time, when Kajal realises that she is not giving her 100% towards her job and thats when things begin to fall in place in her life. 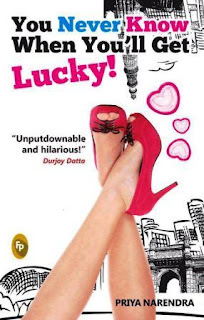 "You Never Know When You'll Get Lucky" is an unputdownable, witty and fast paced read, which instantly falls in the my kind of book category. The characters are very real and you would feel that you have seen them in your life too. Love makes you do weird things and when it comes to dating, things get a lot more weird. By the end of the 3rd chapter, Priya Narendra was successful in grabbing my interest, which is a good thing. It took me around 3.5 hours to finish this 230 page book. The book is a complete entertainer, with a no non-sense plot. You might feel that you can predict the plot, but it takes you by surprise towards the end. I loved the way, the title of the book has been connected with the story, but I would not like to get into the plot, because it might reveal everything. Pick this book if you are going for a small journey and have got nothing to do. I promise you, it won't bore you.